Often me and my friends from school or college sit down over chaai and beat ourselves over our ideas about life, wedding and marriage back then. We have gracefully accepted that compared to our younger counterparts — the generation to which our offspring belong — we were the stupider generation, if not the stupidest. There is always a level of naivety at a young age. The stars in our eyes cloud our vision. Yet today’s generation is smarter in some ways, if not all, than us. For starters, they know that after the “wedding” there is something called “marriage”. Back then, we had one single word for both very different concepts — shaadi. For us, shaadi meant the rasoomaat (traditional wedding rituals), the dresses, the jahez and bari (yes, we come from that stone age era where jahez was not a bad word and was politically correct, and bari was a given). Our focus was the wedding and not so much the marriage as we set off on our, perhaps, most important journey that was to change the course of our lives. So here are the pros and cons — on a comparative level — between the age of innocence (or stupidity) and the age of the so-called Generation Y (our smarter counterparts). The Net Generation knows, for the most part, what it wants out of life. They have definitive goals, and marriage is, for most if not all of them, ONE of their many goals. For us, it was THE most important goal. This is why the wedding hype in our over-dramatic times was emotionally exaggerated. The crying at the time of rukhsati was a given. It’s not that brides today won’t miss their folks but the make-up is a result of either parents or the by-now-earning bride working hard to pay the make-up artist loads of money. Loads are always relative, of course. Today’s bride cannot afford to faint in sadness at rukhsati time. She knows that some 20k went just into her dupatta fixing and jewellery setting. She got the appointment a year in advance. It’s not worth it to get the mascara to flow. Besides, crying can be done on another day. The millenials are also very clear in terms of who they want present on the wedding. Their “friends” are key. It’s ok upto phuphi, chachi, maami and khala. And cousins are always good fun. But they don’t want distant relatives or neighbours of an area the parents left 20 years ago. They want smaller but “classier” weddings. They’d rather spend on the flowers than on people who don’t mean much. The brides today are also smarter in that they are not big on gold jewellery because prices of gold have skyrocketed. So they are smart enough to use silver that is gold-plated. They also wear one carefully selected set. ONE. As opposed to brides of my generation wearing like 5 necklaces on any given shaadi. The brides today are decidedly more elegant. The groom is more well-groomed, really. The couple portraits are more picturesque at smartly chosen locations. Their invitees are more select. They know that weddings lead to marriage. They are simply smarter. Or are they? While the weddings of millenials are smarter, the old world charm has been lost in some aspects. Just take the excessively choreographed mehndis for one that seem more for Instagram and snapchat and less for the simple joy of unrehearsed celebration that came out of spontaneous luddi and singing tappay. The dholkis have everything but a dholak. While smaller weddings are a great idea, they would truly be great only if they are less ostentatious and lighter on the pocket. We invite less people but end up spending more money. The event management, flowers and elaborate menus from upper tier caterers are a huge burden on the families. Even if one can afford it all, is it a must that we spend not lacs but millions? Also, there was a certain warmth in inviting relatives and old neighbours. One can and may limit the number of people, but why leave out those who have been a part of the lives of these families? The rasoomaat are debatable for many reasons — religious, cultural or due to social evolution. But the joy of sharing this momentous occasion is a pre-requisite. While we laud the weddings of today on account of some smarter choices, are these choices really pragmatic, or has our extravagance simply changed forms? The jewellery may now be gold-plated silver, and it may be a single set the bride wears, but what about the wedding dress that takes years to plan and order, and costs a fortune, and is so heavily full of work that it provides no visual relief, yet is something we don’t seem to mind. Earlier it was jahez. Now it is expensive wedding dresses by designers and elaborate wedding events. Have we actually had a paradigm shift socially? Look closely and nothing has really changed. Weddings are a pricier affair than ever. And while the millenials are smarter in their life choices, they are sometimes so smart that leave alone wedding, they doubt if even marriage is a good idea, because it has simply too many strings attached, and is too much commitment. The wedding is a special occasion. It opens the door to a new and special journey. But our society is sitting on the crux of change. As families and as a country, can we afford such extravagance? Without over-spending and showing off, one can still have a fun, festive, joyous wedding. The money one saves can help so many others. If no one else, it can help the couple settle in life. Posted in Culture and Society and tagged millenials, Pakistan, pragmatism, society, weddings. Bookmark the permalink. A wave of nostalgia grips most of us when we reminisce about eid of bygone years. The countdown to eid would begin the day the Ramzan moon was sighted. As children, we would go out in the garden or on the roof and try to catch a glimpse of the moon on chand raat. Thereon the preparations would begin. The sewaiyyan, the sheer khorma, the mehndi, the glass bangles, the trolley set for guests, the giddy excitement whenever the bell rung, the eidee…eid was festivity at its best. Eid is the highlight of the year for so many of us. Or is it? While much remains the same when it comes to traditions of eid, there is much that has changed. For starters, on eid one could just go and ring a relative or neighbour’s bell, go in for a treat, and enjoy. There was an excitement in the anticipation of who would come to visit. However, over time the concept of “Open House” was introduced. There is now a specific time on which the doors open to guests. If you miss that time window, it is unlikely that you will get a chance to go there again. Faster times. A faster world. Another thing that has changed is the practicality. If we have met someone on the first day of eid as they visited you or met you at your grandmother’s, we no longer want to meet the same people again by visiting them, unlike the earlier culture of exchange visits, where if someone visited you, it was a must that you also visited them. There are also lesser of the big, gigantic eid get-togethers at the homes of the elders of the family, simply because families have grown and multiplied, house help is less readily available or affordable, and quite frankly it’s too much work for the overworked daughters-in-law or daughters who used to be doing the tough work of pulling off lunches for 80 people every eid. Yes, our societal dynamics are in flux, if not completely altered. Some 20 years ago, girls were so conditioned to put mehndi on their hands for eid that it never even occurred to them that eid could be without mehndi. From the crushed raw henna leaves era to the chemical-filled henna cone era, and now to the glitter-filled henna tattoos — henna still remains a part of the eid tradition. But many no longer choose to have it applied. Some find it itchy, others don’t like the smell, and yet others feel it looks very unprofessional to go to office the 4th day of eid with henna peeling off one’s palms. There are also lesser of the big, gigantic eid get-togethers at the homes of the elders of the family, simply because families have grown and multiplied, house help is less readily available or affordable, and quite frankly it’s too much work for the overworked daughters-in-law or daughters. Some things may have changed for the better, though. 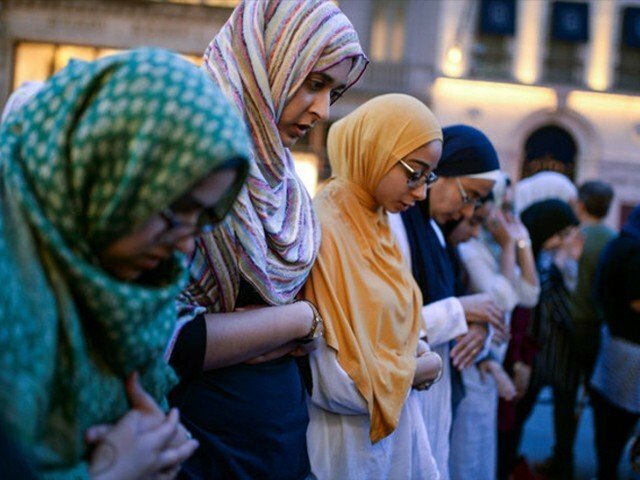 While a majority of women still don’t get why they should also go to the mosque for eid prayers, mainly because their men still don’t get it, there is a growing number of Pakistani women at least in the major cities that do go for eid namaz. I happen to be one of them and I can say safely that it is a beautiful experience that acts like a bridge between Ramzan and the rest of the year. In the absence of going for eid namaz, the spirituality and the connection with the Creator one has inched towards in Ramzan is suddenly lost on eid morning, and eid becomes just another day, barring the eating and meeting and dressing up. As for eidee, it still remains an intrinsic part of eid, and children (they could be in their 40s for all you know) look up to their elders in the hope of that coveted envelope. However, in earlier times one would give eidee to any and every younger person one met. Now parents have become smarter and more calculative. They have separate lifafas (envelopes) for those who give to their children generously, compared to those who give smaller sums. But perhaps the most obvious change is that so many of us use eid holidays for vacationing. With the number of Pakistani expatriates increasing by the minute, and a few family members travelling on eid for vacationing, there is that void that not having one family member leaves for the rest, especially on happy occasions. Add to it that many parents can be seen complaining that their children sleep it out on the eid day. But there are some beautiful traditions of eid that continue to date. Giving (starting with the fitranah), feeding (the sewaiyyan above all), sharing (eidee is sharing money, isn’t it), reconnecting with relatives, looking good, feeling good, and celebrating having gotten the opportunity of another Ramzan. It is hoped that this — the real spirit of eid — will survive the test of time. Posted in Culture and tagged Eidul Fitr, Pakistan, society, The news on sunday. Bookmark the permalink.